Apologies if this has been covered, but I couldn't find any info on it. Recently I've noticed when GSM scans my saves, it updated every file in my archive. The timetsamp in the file as well as the file's last modified flag. This means when I sync to Google Drive, every game is re-uploaded every time, rather than just games that have had recent changes. Is there a way to set GMS to only update archives if the game save files have changed? I remember using GSM a few years ago, and I don't remember this issue. Thanks InsaneMatt. I did indeed have those options selected. Unselecting "Create a separate archive" seems to work, but then you get one single archive with all saves within it. This means if there are any changes, I would have to re-upload the whole file. Is there a way to keep separate archives but only update archives that have game save changes? I tried the other option under "Create a separate archive", which is "Add timestamp to each archive's filename" and I get the same behaviour. 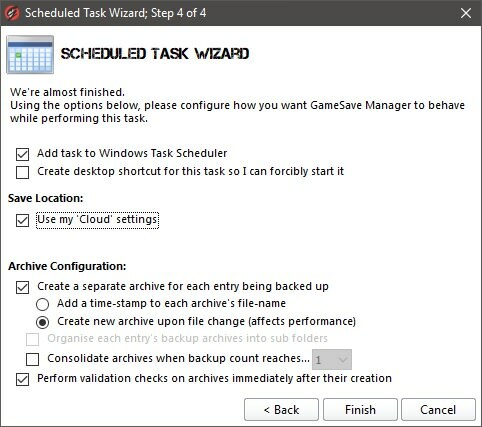 Check your task logs to see why GameSave Manager is recreating the archive(s). Got it working now thanks! Apologies, I misunderstood your original reply. I had those settings originally and it was re-archiving everything. Not sure why. So I decided to start from scratch. I delete the old task, created a new task, and created a fresh archive set and all is working fine now.